I Blender user, which is very bad speak English. I have always been interested in animation. Yafaray saw the problem, if the number of polygons more than a million. The best time was the PovRay. When I collaborate with the developer of the official version of the addon for Blender render_povray. A year ago, I learned about theBounty, but it is not interested, but watched the development of the project. Yesterday I learned about C ++ exporter today made it. 9 500 000 quads or 19 000 000 tris. I know Python API Blender and going to learn C ++ and write code to transfer data from Blender to Povray directly, without the use of files. But, if the Bounty faster, then I want it. I think povmaniac is going to answer this, I haven't been on the C++ part the last month. I are talk with Povblend developer sometimes and I added or suggest some code in the past ( for smoke..). My problem is the fault of free time for dedicated to all projects :). But i want finding some time this summer for going back to C++ Blender integration. Currently, the geometry is the bottleneck of Python exporter's. If you have some suggestion for collaborate between the both projects, not doubt it to say me. Maybe I rushed to talk about integration. You may need to remove the bug. The bounty is not working blend material for the two glass materials. I create a cube with subdivide surface modifiers (val = 4). Load image BlackWhite: black and white horizontal lines. in texture influence check blending amount. Replace blend material in first place. Render result: Yellow glass sphere. In Yafaray-Experimental render result: glass sphere with red and green lines. Hi lanuhum. I think that Yafaray dev are introduced some changes in materials. So, maybe is not possible reproduce the same results with TheBounty. I seems that have an small bug with 'blend' mask texture. I am working for fix it. I did not say that when I use the addon with C ++ exporter, when you open this file, Blender emergency stops. This also happens if I try to create a similar material. As for C ++ exporter. You used cython? I have not seen anywhere .pyx files. My idea is the opposite. 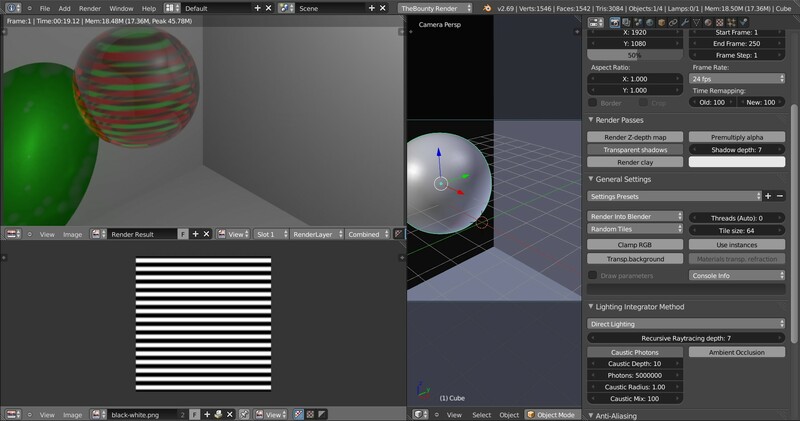 To render an animation I want to use the blender as a python module inside the external render. This will create a very big scene (10 - 50 Millin polygons) of several Blender files. Blender does not allow to create such a scene in one file (2 - 4 or more gigabytes). External render for this should be the GUI. I have made an attempt to capture data from a python module of Blender in C ++ code. Static objects can not restart them from frame to frame. This saves time. But now it's only an idea. I rendered the file .pov 4 gigabytes. In Blender it does not fit. Ah!. Ok. It seems interesting. If you have time, it can enter our channel of IRC and share his ideas with us. We are not too much, between 4 and 8 persons. I am a primitive man. I do not know how to use modern means of communication. But there is nothing to say. I will write the code in C ++ and I will show you. You look, and make conclusions. Not until Monday. clipka told me that the source code povray does not allow to do what I want. The code in a big mess. But, why are you talking to me about the Povray here? but keep up the work, it's always good! I came across an obstacle. Py_Finalize() kills apps. What you need to be reset. Which variable is stored. I do not like this work. But what we have with the glass, which is a blend of material??? You wrote that bug - a little mistake. The problem was in the exporting? And, what about the exporter in C ++? And btw.. his development are stopped, at the moment. with photon mapping result is also green (shadow and caustic). You are sure that use the last TheBounty 0.1.6.rc4 from donwload page + last 0.1.6.rc4 exporter from github page?? I'm moving this to Development forum, if you don't mind.